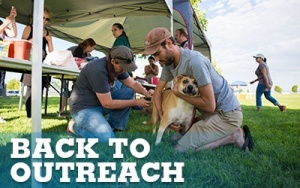 Each camp session is led by Animal Humane’s professional Humane Educators, with help from Animal Humane Education Volunteers and, during the summer, Youth Volunteer Counselors, trained students age 15-18 who wish to volunteer some of their summer hours to help homeless pets and their community. Unleash your child’s love of pets this summer at Camp Humane! Our Camp Humane summer camps are designed to let children explore animal-related topics, learn more about pet care and discover how humans can help animals. Camp Humane Junior is a 4-day, half day camp for kids ages 5 – 7 who have completed Kindergarten. Camp days run from 9 AM – 12:30 PM, Monday – Thursday. Registration for Camp Humane Junior is $100. Camp Humane regular sessions are 5-day, full day camps. Sessions I and II are for kids ages 8 – 10, and Sessions III and IV are for kids ages 11 – 13. Camp days run from 9 AM – 4 PM, Monday – Friday. Registration for Camp Humane is $250. Registration opens on Monday, March 18th at midnight. Sessions do fill quickly. To register: click on the Events Calendar links below. There is one event for each session. Complete the registration page after following the link. Please note: if you are registering multiple children, you will need to complete a separate registration for each one. Please review the FAQs below carefully for more information. Enthusiasm for helping animals and working with children ages 5-13. Daily Duties: Our Junior Volunteer Counselors will prepare activity supplies for the Humane Educators (before and after camp); assist in presenting curriculum and leading activities; assist with set-up and clean up; monitor children, including during animal interactions, ensuring safety and a fun and compassionate learning environment; inspire and motivate campers by maintaining an enthusiastic attitude about animal welfare. Junior Volunteer Counselors will work closely with at least two Animal Humane staff members and 1-2 other Junior Volunteer Counselors to accomplish each day’s tasks. Time Commitment: Volunteering as a Junior Counselor will provide approximately 35 – 50 hours of service/volunteer hours. Junior Volunteer Counselors must be able to commit to assisting at one full week of camp. In addition, Junior Volunteer Counselors need to be able to attend a 2 day Counselor Orientation on June 6 & 7 from 10 am – 2:30 pm. Training: Junior Volunteer Counselors must be able to attend our Orientation sessions offered before the camp session in June. This session will be held on June 6 & 7. During this session we will learn more about Animal Humane, become familiar with our campus, and learn more about some of the topics we will cover during camp and safety with visiting animals. This training session also gives you the chance to meet some of your fellow Junior Volunteer Counselors. Step 1: Write a Letter of Interest. Your Letter of Interest is your chance to tell us more about yourself and why you are interested in becoming a Junior Volunteer Counselor. Your letter should provide us with information such as any previous experiences as a volunteer or completing community service; any previous experience working with animals or children; why you are interested in working with an animal welfare organization; and why you are interested in working with kids. When typed, your letter should be no longer than 1 page, single spaced, 12 point font. Step 2: Fill out our online Junior Volunteer Counselor application. You will cut and paste your Letter of Interest into this application. Step 3: Print out and complete the Junior Volunteer release, which we will email to you upon receiving your application. Step 4: Attend an interview with the Learn Humane team. During the interview you will turn in your release and receive your date assignments for the summer. Step 5: Attend the training days in early June. Questions: Please contact us if you have further questions. The following FAQs are for our Camp Humane Summer Camp sessions. For questions about our Winter Adventure Camps, please see the drop down tab for that event. What time is the camp in session? Camp Humane Junior (for ages 5-7) is a half-day camp and runs 9 am to 12:30 pm, Monday thru Thursday. All other camp sessions (I, II, III, IV) are full day and run 9 am to 4 pm, Monday thru Friday. What is the acceptable age range for camp? Regular Camp Humane sessions are for children aged 8 to 13 years. In 2019, two sessions are designed for children ages 8 – 10 and two sessions is designed for children ages 11 – 13. In 2019 there will also be one Camp Humane Junior session for children ages 5 – 7 who have completed kindergarten. My child does not currently fall into the age range for the sessions I would like to sign him/her up for. Can I sign up anyway? In order to provide campers with the best and most educational experience possible, our summer camps sessions are designed specifically for the advertised age ranges. Therefore, children cannot be enrolled in summer camps intended for older or younger children. What is the cost of the camp? Regular camp sessions (I, II, III, IV) are $250 per child for a the week. for Camp Humane Junior half-day sessions are $100 per child. What is included in the registration fee? The registration fee includes all days of camp, activities, materials, daily snacks, and a camp T-Shirt for all sessions, and a a field trip and guest speakers for regular sessions. Are there scholarships available if my family cannot afford the full registration fee? For 2019, a limited number of scholarships will be offered to children attending APS Title 1 qualified schools. Scholarships will be offered to families through the school counselor. If you are interested in a scholarship and your child attends an APS Title 1 qualified school, speak with your school counselor about this opportunity after April 1. What types of animals will my child interact with at Camp Humane? Our camp curriculum changes from year to year, and campers have a chance to meet different animals every year. Campers will always have the opportunity to meet some of Animal Humane’s pet residents–cats, kittens, dogs and puppies. Because campers will interact with both dogs and cats daily during their session, these camps are not appropriate for children with moderate to severe allergies to either species. Campers have also met or learned about some of the following types of animals over the past few years: bunnies, horses, small animals such as hedgehogs, snakes, lizards, tortoises and insects. Please note: each day of camp will include time spent learning about and interacting with animals as the curriculum allows. While shelter pets are an important part of the Camp Humane experience, time with our adoptable pets will be limited and closely monitored for the safety of both our pets and our campers. Our goal in camp is to teach responsibility and compassion toward animals, and we will have many ways to reach this goal, including crafts, games, guest speakers and daily animal interactions. Therefore, while campers will have daily opportunities to learn more about and meet with different animals, they should not expect to spend significant amounts of time working with or handling homeless pets waiting for adoption. How do I register my child? Registrations can be made online only beginning March 18, 2019 using the links at the bottom of this page. Spaces fill quickly once registration opens. How do I know when registration is complete? Upon completion of the online registration forms and payment, you will receive an email confirmation. This email will be followed by a hard-copy welcome packet with more information about camp, mailed in early June to the physical address you provided at registration. If you think you completed registration but do not receive an email confirmation, you may reach us at 505.938.7864 or [email protected] to verify your child’s registration. What payment options do you take? We accept Visa and MasterCard at the time of registration. What is your cancellation policy? Individuals who wish to cancel their camp registration must notify camp staff at least 14 days prior to the start date of your camp session. The camp registration fee will be refunded minus a $50 processing fee. No refunds will be issued for cancellations made less than 14 days prior to the start date of your camp session. Animal Humane New Mexico reserves the right to cancel camp sessions due to insufficient registration. If a camp session is cancelled by Animal Humane, all registration fees will be refunded in full. When does registration end? Registration will close early June or as each camp session fills, whichever occurs first. What forms are required prior to the start of camp? In addition to the camp application (filled out at registration), and prior to the start of camp, we require that a Photo/Media Release, Liability Waiver and Transportation Release be on file for each camp participant. These forms will be mailed to you in early June. Completed forms should be brought with you on the first day of your child’s camp session. Do you provide lunch? We ask that your child bring a healthy sack lunch and drink each day of camp. We will provide a daily snack during each session. Also, although water fountains are always available, we ask that your child also bring a water bottle that may be refilled. Do you provide snacks? We will provide a healthy snack for each camper daily. Campers with diet restrictions should bring their own snacks to camp. Campers should also remember to pack a sack lunch for each day camp is in session. Do you accept children with special needs, allergies or medical conditions? Please indicate any allergies your child has on their registration forms. Your child will come into contact with cats, dogs, peanut butter and other common allergens while at camp. Daily interactions with cats and dogs will occur and alternatives to interacting with a specific species are not available. Therefore, children with significant cat or dog allergies will not be able to enjoy a full camp experience. With regards to children with medical conditions and special needs, please contact us so we may discuss your child and his or her needs and help decide if our camp is a good fit. How many campers are in each session? There will be a maximum of 15 campers in each regular session (I, II, III, IV) and a maximum of 10 campers in Camp Humane Junior. Is there a waiting list? If the camp session you are interested in enrolling your child in is full, please contact us at [email protected]. We will provide you with information for having your child placed on a waiting list for the next open camp session. Having your child on a waiting list does not guarantee they will be admitted to that camp session this summer, or next summer. If a space opens in any session and your child’s name comes up on the list, you have the opportunity to either accept the open spot or decline it and remain on the waiting list to see if another opening comes up. When accepting a spot, you will be given a specific time frame in which payment must be received to secure your child’s spot in that session. If you choose to decline the spot, we will contact the next family on the list for that particular opening. Can friends/siblings attend the same camp session? Absolutely. We do recommend submitting registration applications at the same time to increase the likelihood that the children will be in the same camp session. Please keep in mind that while siblings or friends will have opportunities to be together, we cannot guarantee that they will participate in each activity with one another. Do you offer before or after care? At this time, we do not offer before or after care. What is the pick-up/drop-off procedure? / Where do I bring my child on the first day of camp? Drop-off is from 8:45 – 9 am each morning. Pick-up is at either 12:30 pm (for 5 – 7 year olds) or 4:00 pm (for all other ages) in the afternoon. You will be required to sign your child in and out with a staff member at the time of drop-off/pick-up, and will be required to show identification during pick-up. Drop-off and pick-up will take place each day in Animal Humane’s Dog Agility Park. How are emergencies handled? In the case of an emergency, camp staff will contact the parent or guardian using the contact information that was provided at the time of registration. If you cannot be reached, we will leave a message and attempt to contact the person listed as an emergency contact on the registration forms. Please make sure this information stays up to date during the duration of camp. In the event that you need to reach your child during camp hours, please contact our Humane Educator, Gina Sena at 505.205.0812. How many campers are there assigned to a counselor? We will have between 2 and 3 Junior Volunteer Counselors for each session of camp. Additionally, camp will be supervised by our Humane Education staff at all times. Who are the camp counselors? Our Junior Volunteer Counselors are high school-aged students between the ages of 15 and 18 who have been through a comprehensive interview and training process. Can I register my child for more than one week of camp? We repeat many activities from week to week and it is our goal to reach as many campers as possible. Because of this, we ask that you register for one session this summer and look forward to joining us again next year. What does my child need to bring to camp? Campers must bring a lunch from home each day. Please also make sure that your child applies sunscreen each morning before camp. They should also bring a water bottle, hat and light jacket with them each day. To ensure there are no mix-ups, label everything with your child’s name. What should my child not bring to camp? We discourage campers from bringing anything of value with them to camp. Electronic items, toys and games should be left at home so your child avoids the chance of it being lost or broken. Animal Humane New Mexico is not responsible for lost, stolen or broken items that may be brought to camp. Cell phones brought to camp should only be used to contact parents in the case of an emergency. Directions: Our shelter is located at 615 Virginia St. SE, Albuquerque, NM 87108. It is one block west of the Kirtland Air Force Base Wyoming Blvd. gate. If you have any questions about how to get to our location, please visit the locations page of our website. Our Dog Agility Park is located just behind our Clinic on the southwest corner of San Joaquin Ave and Virginia St SE. At the end of each camp day, pick up will also take place in our Dog Agility Park. Because we have no after-care available, we ask that campers be picked up promptly at 4:00 pm. Cancellation Policy Individuals who wish to cancel their camp registration must notify camp staff at least 14 days prior to the start date of their camp session. The camp registration fee will be refunded minus a $50 processing fee. No refunds will be issued for cancellations made less than 14 days prior to the start date of your camp session. Animal Humane New Mexico reserves the right to cancel camp sessions due to insufficient registration. If a camp session is cancelled by Animal Humane, all registration fees will be refunded in full. Time with Animals Each day of camp will include time spent learning about and interacting with animals as the curriculum allows. While shelter pets are an important part of the Camp Humane experience, time with our adoptable pets will be limited and closely monitored for the safety of both our pets and our campers. Please note that time is spent with both cats and dogs every day of the camp session. If you are concerned about your child possibly having mild allergies to pets, we recommend you discuss options for helping your child stay comfortable during pet interactions with your pediatrician prior to camp and administer any needed medication prior to the camp day. Camp Humane staff cannot be responsible for medicine administration or providing alternatives to animal interactions if your child has pet allergies. It is therefore not recommended for children who have significant allergies to either cats or dogs. Our goal in camp is to teach responsibility and compassion toward animals, and we will have many ways to reach this goal. Therefore, while campers will have daily opportunities to learn more about and meet with different animals (including shelter dogs and cats and visiting animals), they should not expect to spend significant amounts of time working with or handling homeless pets waiting for adoption. Any animal handling/interactions will be closely monitored and restricted as necessary to ensure the safety of all animals and campers. Participant Behavior While participating in camp, all camp participants are expected to treat other campers, staff, volunteers and animals with respect and compassion. We will review behavior guidelines with campers on the first day of each camp session. These guidelines include expectations for calm, appropriate behavior around visiting animals, following the directions of camp staff and counselors, staying with the group, participating in camp activities, and treating all other campers with kindness. If a camper is unable to consistently follow these guidelines, they may be asked to leave camp for the day, or may be dismissed from the entire camp session. If a camper is dismissed for behavioral reasons, there will be no refunds available. Zero Tolerance: We have a zero tolerance policy regarding bullying and fighting with fellow campers, or harmful treatment of visiting animals. Acts of this nature are grounds for immediate dismissal from the camp session. Camper Cell Phone / Electronics Campers may bring a cell phone to camp at the request of a parent or guardian. However, campers should expect to use this phone only to contact parents in case of an emergency or to contact a parent for pick up at the end of a camp day. Calling, texting or playing games on cell phones during camp activities is not permitted and may result in confiscation of the phone until pick-up time. Other electronics, such as games, music devices, tablets, etc., should be left at home. Details for the 2019 sessions of Winter Adventure Camp will be posted in Fall 2019. Join Animal Humane for a fun winter experience like no other! Our 2-Day Winter Adventures are designed to let children explore animal-related topics during school’s winter break. Dates for 2019 coming this fall! Winter Adventure Sessions run from 9:00 am – 4:00 pm. Campers will need to bring a sack lunch. Snack will be provided in the afternoon. How many campers are in each session of the Winter Adventures? Space is limited to 15 campers per session. Can campers attend both sessions of the Winter Adventures? Not in the 2018/2019 camp sessions. This year’s camp sessions are divided to be appropriate for specific age groups. Please select the session that is appropriate for your child’s age. What is the cancellation policy for the Winter Adventures? Camp registration can be cancelled up to 1 week in advance of the camp session for a full refund. Cancellations less than a week in advance will not be refunded. All other policies are the same as for our Summer Camps. Please see the Policies tab above. How do I register? To register, click on the Events Calendar links below. There is one event for each Winter Adventure session. 2019 Summer Camp Session registration will open Monday, March 18 at midnight. Please note: if you are registering multiple children, you will need to complete a separate registration for each.